Editor's note: A version of this article was originally published in the SABR Deadball Era Research Committee's February 2015 newsletter. The contributions of Dorothy Seymour Mills to our understanding of baseball history can hardly be overstated, as her work with her husband Dr. Harold Seymour on the 1971 book Baseball: The Golden Age laid the foundation for the endeavors which our Deadball Era Research Committee undertakes today. As is now widely known, Dorothy’s contributions to all three books remained unrecognized until after Harold’s death because Harold Seymour took credit for the research, organization, and writing with which Dorothy was involved. 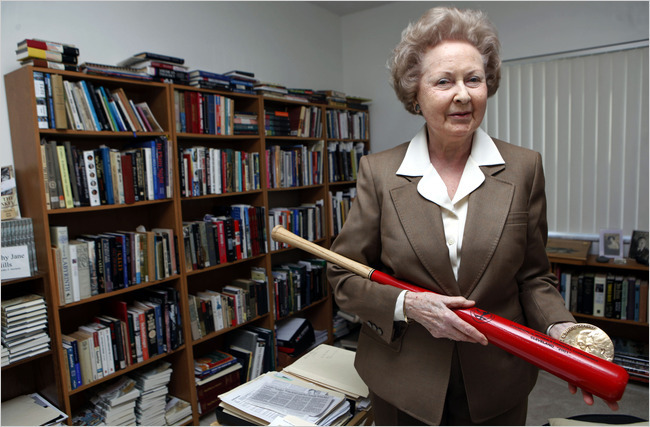 In a 2011 article at CNN.com, SABR member Steve Gietschier offered that Seymour went beyond just taking her work: “He stole her personhood.” Dorothy was, Gietschier said, “the invisible hand that shaped the three volumes.” Interested readers can find reflections on her relationship with her husband and comments about her baseball writings in the 2004 autobiography, A Woman’s Work: Writing Baseball History with Harold Seymour. I had no particular motivation to write about this or any other baseball era — at least, not until I began research and realized that the research material contained a lot of fascinating history, with its hard-driving businessmen engaged in trade wars and its earnest-sounding professional players trying to make their way in a competitive occupation. Even more, I enjoyed learning about the amateurs, with their amazingly strong devotion to playing the game whenever and however possible. I consider Ty Cobb the most interesting player of the era. He evidently played with remarkable intensity, perhaps because of mental imbalance caused by a traumatic event in his childhood. He seems to have placed ethics rather low on his list of importance, especially at the time of the Cobb-Speaker-Leonard Affair. That shows him as a flawed hero. I felt that understanding this era gave me a clearer view of American history, because both professional and amateur baseball reflected historical trends in the general population of the time. Some examples of these trends follow. Adults were intruding on children’s play. Schools were embracing athletics, although mostly for boys; the PSAL became prominent. The rise of the American Legion was accompanied by an obsessive fear of communism, which the Legion used as a reason to establish Legionnaire Baseball for boys. In colleges and universities, higher education was changing as it began buckling under to organized athletics, which began to dominate higher education, and professional baseball took advantage of this development. Business, which had earlier banned baseball among employees, followed the example of education and first permitted play, and then sponsored it as a way to keep employees happy. Amateur tournaments, some business-backed, went national. The military began sponsoring baseball for its own reasons. Women who wanted to pursue baseball as a career found themselves relegated to softball. In this period in which reformers tried to improve prisons, baseball became an important tool for them. Black men, having been squeezed out of Organized Baseball, created their own separate and unequal organizations. These events show baseball as woven closely into the general history of the period. In this era, I think it’s the drama of the Black Sox Scandal, and those scandals that preceded it, that capture public imagination the most. From today’s viewpoint, understanding how the Scandal took place is difficult, because the settings are so different now. Players view their role differently, and owners find different challenges in relating to players. But drama is always appealing, and when pathetic people like Joe Jackson as well as notorious gamblers like Arnold Rothstein become part of the mix, you get drama. The Black Sox Scandal makes as good a story as any created for TV, and it's real. The appeal of drama remains universal, not just for baseball fans. Moreover, the era in the major leagues featured “inside ball,” lots of infield action, and colorful attempts by pitchers to create (illegal) ways to dominate play. I think that style of play, so different from the style that followed, attracts readers. Also, I'm sure that the perennial questions surrounding the Merkle play make for a mystery that baseball fans can keep debating forever. Since writing in Baseball: The People’s Game about women’s efforts to play baseball, I have continued my special interest in the subject and have included chapters about it in other books. I see women’s experience in baseball as closely related to their general experience in society, and I have prepared a short but book-length manuscript about some of the strong women who have tried to play the National Game despite constant harassment, calling it “Undaunted Boldness,” a term borrowed from Emerson, who believed (in the 1840s) that women should be strong and bold. Emerson languished distinctly in the minority, however, and most men considered strong women who wanted to play baseball to be weird and unwomanly. Actually, when we learn about what these women endured in order to pursue baseball, we realize that we can apply the word “heroism” to their acts. If my agent places this manuscript successfully, it will become my 30th book. Not all of my books, however, relate to baseball. Looking back on a long career in writing (I am now 86), I’m glad that I saw the promise in the field of baseball history. I view the study of baseball as a way into the understanding of American history in general as well as a fascinating topic in its own right. For the framework of whatever I wrote, whether fiction or nonfiction, I always looked to the New York Times, because it could boast the best reporters and because it stationed them around the world. But for colorful additions, nothing can compare with the local reporters, who often sprinkled their stories with personal comments, opinions, and homespun advice as well as attempts at humor. In other words, they treated news like feature stories. In sum, their newspapers did not merely give the news; they showed what at least some local residents were thinking about the baseball events going on around them. Yes, local reporters exaggerated and took sides in squabbles, but historians take those matters into consideration when writing. We use their opinions the way we use those of other commentators we know are biased. We make it obvious in our writing that we include those stories for local color. Two topics proved especially daunting in writing about this era: the Federal League’s challenge and the Black Sox Scandal. I wished that when treating of the Feds we could have afforded to visit every Federal League city to sample the local newspapers. They would have enriched our approach and perhaps given us some new insights. As for the Black Sox, not until Gene Carney finally fished out some sources that Seymour and I had searched for unsuccessfully did a more rounded picture of the events emerge, but even Carney’s devotion to the subject has not helped us truly understand why the Scandal took place, although William Lamb’s additional work has helped. What I think researchers should focus on became the subject of my keynote address to the Nineteenth Century Committee's Frederick Ivor-Campbell Conference at Cooperstown in 2014: what was happening among amateur players while the pros were flirting with cheating, engaging in trade wars, etc. College ball, for example, was getting so highly professionalized that even college presidents were appalled at the downgrading of education in these institutions; the military was drafting baseball; and most women were being kept as far away from baseball as men could keep them. I think most events in professional baseball during this era have been studied enough for us to understand them. What I believe we need now (as I explained in my Cooperstown presentation) is a conscious effort to integrate professional and amateur baseball history. I believe we need a full history of baseball as it arose in small towns across this nation. Town team baseball is the simplest and purest form of the game and could show us something about the things pioneers thought most important in their lives. We also need a full history of religion’s effects on baseball, including a consideration of the way religionists taught women that they must be servants to their husbands, avoid having a life outside the home, and never aspire to enjoy something active like baseball. We need a full analysis of the way adults took over children’s play in schools, municipal organizations, and community groups like Little League, Legion baseball, and others. How has such a general takeover affected our general culture? Is it part of what evolved into “helicopter parents”? We need an analysis of the way baseball infiltrated colleges and made them bow to professional baseball. Has higher education suffered because of it? The two things about my baseball work that I am proudest of are recognition by Cooperstown and acknowledgement by Oxford University Press. In the Hall of Fame's magazine of March 21, 2012, Jim Gates, the Librarian of the Baseball Hall of Fame and Museum in Cooperstown, wrote, "Today, with dozens of graduate students of both genders laboring away at baseball-related dissertations, they can all thank Dorothy Seymour Mills for her efforts as a researcher and writer for making baseball history an accepted field of study." The recognition by Oxford came the same year, when the company decided to publish a new edition of the three volumes on baseball history that Harold Seymour and I prepared, this time with my name as one of the two co-authors of the series. For the third volume, my name comes first in the author line, since for that book I was the senior author. These two events meant a lot to me, for they demonstrated (after many years) that the Hall of Fame and the publishing industry recognized my work in the field of baseball history. As an English major and a long-time professional editor, I’m always concerned with the way ideas are presented. In preparing the three books for Oxford, I also had to concern myself with the blending of two styles of writing, Harold Seymour’s and mine. Such blending can succeed only if one style predominates. We began collaborating on the writing in this way: I selected the notes that I had set aside for a particular chapter, organized them logically, and used them to write an outline of the chapter, which I handed to Seymour. He used my outline to write a first draft, and I took it from there, editing or revising as needed. But my outlines gradually changed into first drafts, which Seymour read and commented on, and soon they morphed into final drafts, which Seymour looked over. While we were working on the third volume, he stopped contributing entirely. Seymour’s heavily academic style contrasted with my more forthright prose, and because I was the editor I had the last word, so the style of writing in these books reflects mine more than his. I’ve always believed in “lean prose,” low in adjectives and high in verbs. I make an effort to eliminate most forms of the verb “to be” as well as the passive voice, and I check for repetitions, vague antecedents, and other grammatical lapses. I also read and re-read final drafts several times, picking up problems I failed to notice earlier. These measures help speed the action of the sentences. I recommend that all prospective historians study Fowler and E.B. White on ways to write clearly and say exactly what you mean. Your readers will thank you. I have one regret: that we took at face value the assertions of Al Stump, who wrote first a long article and then a book about Ty Cobb’s last days, both of which were later believed to be inventions. Stump’s descriptions fit in too well with what we wanted to believe about Cobb, but they were probably great exaggerations. I have a tendency to think everyone tells the truth, so it was hard for me to view Stump’s assertions as apocryphal, especially because of all the details he included. Another matter should concern all historians. The revelation by Peter Nash at Hauls of Shame that someone has stolen some of the valuable manuscript materials from the Herrmann Papers appalls me. The Library needs to take much better care of our historical heritage. We scholars should remind the curators of this heritage so that future generations have the opportunity to examine, and re-examine, the material that reveals our past to us. For those scholars interested in this era of baseball, I recommend they visit the Seymour Collection in the archives of the Kroch Library at Cornell University, where Elaine Engst presides over the archives. The Library welcomes scholars, and many have taken advantage of the invitation to examine all the research notes I took and many other pieces of material in the Collection. To judge the contents, scholars can read Cornell’s guide to the Collection by going online. This document is called “Guide to the Harold and Dorothy Seymour Papers, 1830-1998, Collection Number 4809, Division of Rare and Manuscript Collections, Cornell University Library.” From time to time, I send the Library more papers, consisting of notes taken for my books along with correspondence and other documents and materials. Although Oxford declined to publish our footnotes, scholars interested in the Deadball Era can get a good idea of the sources used to write Baseball: The Golden Age (Oxford University Press, 1971) by examining the Bibliographical Note on pages 465-471. Finally, I would like to point out that one important aspect of baseball history in every era has been greatly neglected. Most authors have preferred to write about the professionals rather than the amateurs. In fact, they seem to have forgotten that amateur baseball players even exist. 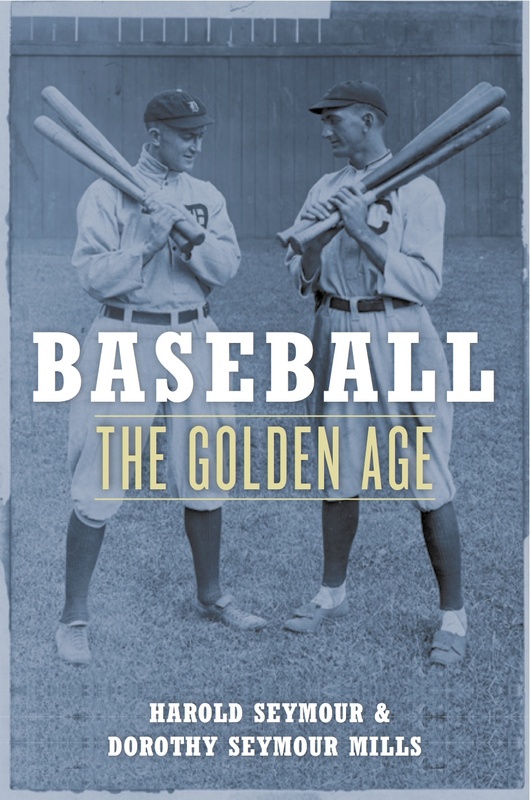 Mitchell Nathanson, for example, has written A People’s History of Baseball (University of Illinois Press, 2012) that makes a very good book, in the tradition of the historian Howard Zinn. But the book does not really give us a history of baseball; it offers us a history of professional baseball. That’s why, when asked to speak at the Frederick Ivor-Campbell meeting in Cooperstown, I addressed myself to the notion that finding out about amateur baseball (for example, where it started all over the country) remains just as important as finding out about the professionals. Moreover, unless the researcher is very careful, writing a player bio about a famous professional or a club history of a successful pro club can too easily degenerate into a book of fan worship. History must be even-handed. In looking into the past we may find out things we’d rather not know, but they are part of history, too. This page was last updated March 1, 2017 at 11:43 am MST.